The planet Argon will be destroyed…. 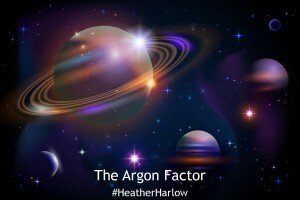 Argon was a peaceful planet with strong scientific advancements in every realm. It was a major ruling planet in the Baldracon solar system. The Argonian race was not aggressive because their people lived life for happiness. They had no room for materialistic quests and goals. Their planet was a true utopian society. The Argonians are proponents of higher education and evolution of all races and species. The are highly intelligent beings and a more developed version of humans. Their scientists are the most intelligent of any alien race that’s ever been discovered. The people of Argon look at power as a serious responsibility to improve and stand for the goodness of others. They do not use power as a way to make themselves better or better their own lives. They realized that by making their world as a whole better, their individual lives improved. The professors and scholars of Argon were admired and sought after throughout the Baldracon solar system. Through their heightened knowledge, the scientists realized that eventually their sun was going to explode and become a black hole. The sun was getting hotter by the year at an increasing pace. They had to find other solar systems able to support their lifeforms, thus spurring an increase in deep space explorations. Finding other solar systems with compatible planets was the easiest step in the Argon survival plan. Their scientists had been combing and observing different universes for several millennia. They already knew of several planets they’d been visiting. They stationed scouts where they could. They kept tabs on these planets and the advancement of life on them. When their major sun had an internal explosion, speeding up the destruction of their universe, they tried to warn all the alien races, friendly or not. They sent out a general message to all species in their solar system. Then they began implementing their evacuation plans. The Argons did not have time for the other alien races unless they wished to collaborate on escaping the universe. Arrogantly, no other alien race took them up on their offer. Dividing the planet’s people and transporting them to the different solar systems was the most difficult step in Argon’s evacuation plan. The scientists were developing special survival technologies and spacedomes to transport their people This involved not only designing and building ships to carry their people, but also designing the laws and policies needed to guide their people through the transition to a new world. The elders developed an intricate plan and general directions for all the colony ships. Each ship had a target planet and/or solar system. Once one of the colony ships verified a viable planet, all other colony ships were to rendezvous there. The colony ship, Spirit’s Destiny, was the first to reach and verify a viable planet….. Earth. They sound a lot like Americans were once upon a time.